There is a bunch of things to like about the 2014 Mazda 3 i hatchback. It just seems that you’ll enjoy them more if you’re sitting in one of the front seats. On the tiny ledger of things to not like about the car is a back seat with limited adult leg room and a roof that’s never very far from a rear-seat passenger’s scalp. Part and parcel with these issues is challenging entry and exit, especially if a front seat is pushed far back. While we’re getting stuff off our chest, the Grand Touring-level hatch we drove generated a steady thrum of road noise that while not maddening was persistent. And then there’s the radio. We pressed, tapped, and twisted the Commander Control knob on the console, accessing any number of audio functions along the way, but couldn’t manage to stumble across anything that looked like a way to select and store station presets. Yes, yes, we’re sure they covered it all in exacting detail in the owner’s manual, but prior to this we hadn’t run across a car yet that didn’t soon reveal its preset process to the trial-and-error user. To our mind, the owner’s manual is for important stuff like service intervals, troubleshooting, and how to switch the clock from 24-hour to 12-hour mode; operating the radio should be a no-brainer. 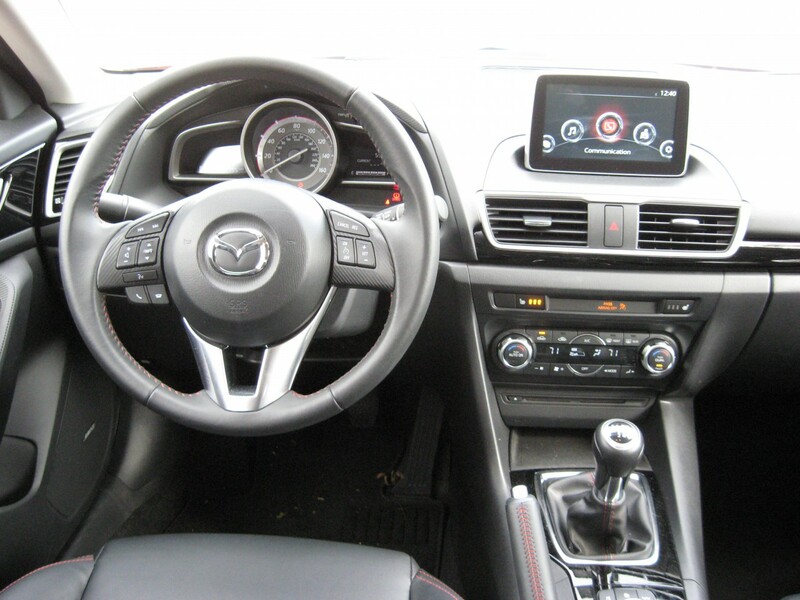 Reminiscent of BMW’s iDrive system, the audio and navigation controls on the new Mazda 3 require familiarization. John’s not a fan. Tom is. However, when we weren’t manually dialing between stations, the Mazda3 i proved to be sufficiently fun to drive. The 2.0-liter dohc 4-cylinder engine generates 150 horsepower, enough to get on the highway and stay there without drama. The car in this test was equipped with a 6-speed manual transmission with nicely spaced ratios and a cooperative clutch and shifter that made it easy to operate, even in stop-and-go traffic. There’s enough low-end torque on tap to let the car idle along in first gear without having to goose the gas. Over 158.6 miles, 62 percent of them in city conditions, this driver averaged 26.35 mpg. Ride from the fully independent suspension was slightly firm but damped well enough to ward off nasty jolts. Steering was responsive, braking prompt and predictable. There was a nice look and feel to the interior surfaces. The tested Grand Touring’s seats were covered in leatherette, but real hide covered the steering wheel, shifter knob, and brake handle. Carbon-fiber-look panels on the arm rests house window, lock, and mirror controls. Comfortable heated front seats offer good support and grip, and the driver enjoys 6-way power adjustment. There’s adequate leg and head room up front, though we suspect folks much over 6 feet tall might beg to differ. The standard power moonroof does take up some overhead space. A covered storage bin doubles as a front arm rest and two open cup holders are sunk into the center console. Rear-seaters can avail themselves of a pull-down arm rest with cup holders. There’s good small-car cargo space in the covered rear compartment and split-folding 60/40 rear seats open up more hauling options. Allow me to be the first auto writer to not complain about the Mazda 3’s new audio/navigation interface system. I am not complaining because I find the big, upright, and dash-center screen remarkably easy to see and refreshingly honest about what it is. Mazda 3 fans will recall that the navigation screen in the previous-generation car was both tiny and buried deep in a dash recess. This made for some awkward moments when traveling by navigation guidance in cluttered urban environments. Making out streets just dozens of yards apart was impossible on the diminutive screen. That’s changed for ’14, but fortunately, the 3’s charming character has not. 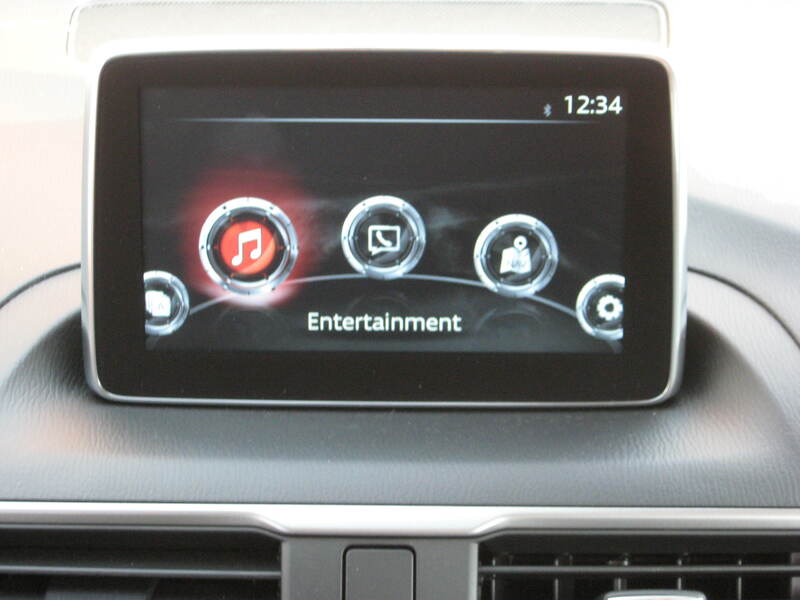 Big new navigation screen is a huge improvement over the tiny unit in past-generation Mazda 3 models. Our test car was a i, which means, among a few other things, that it’s powered by a 2.0-liter engine. The s model packs a more potent 2.5-liter mill. I’m cool with the i, though, as it’s a delight to drive, providing you enjoy using a shifter. The 6-speed manual in our test car was a smooth and refined piece, though perhaps a little long-throw for the boy-racer set. But paired with the 3’s delightfully light and accurate clutch, the shifter feels perfect for any driving less enthusiastic than track duty. The Skyactiv engine is a jewel of good behavior, and can certainly claim to be among the most refined in this class. When worked hard the 2.0-liter four produces sufficient power to merge, pass, cut through traffic, and produce the occasional grin. Off revs, however, the engine can he slow to react to throttle inputs, a situation that is only remedied by a downshift or two. Strangely, I did not notice this same condition in automatic-transmission equipped versions of the i I have sampled. And, like the Mazda 3 models before it, the 2014s remain frisky handlers, providing quick moves and decent grip without taking a toll in ride quality. Inside, the 3 is a little more upscale than before, but just a little. 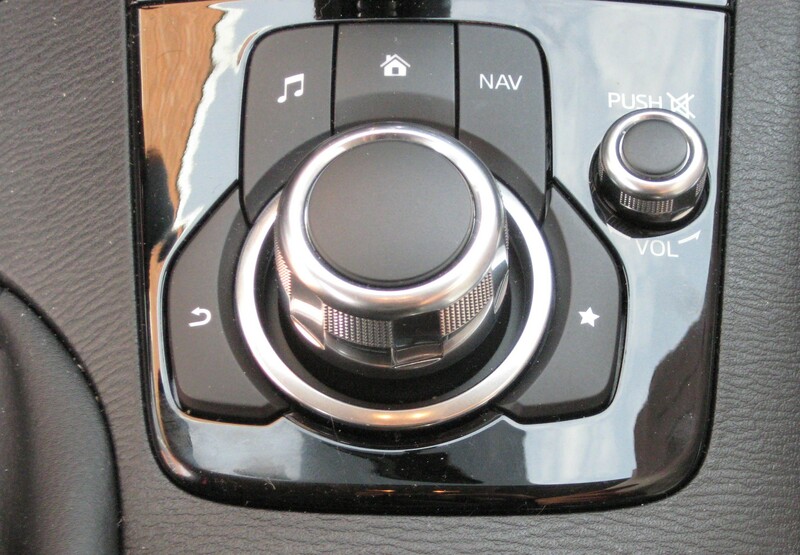 The big change is the iDrive-like controls on the center console. Most drivers new to the system will kvetch for a week or two until they realize that working the radio and navigation screen without lifting your arm off the armrest is actually pretty cool. Or tester came in at almost $25,000, which only seems like a lot until you realize that our loaded Grand Touring example is equipped with virtually every possible option. I never got around to tiring of the old Mazda 3, and here we have a new one. The good news is that it feels very much like the old 3, only it goes farther on a gallon of gas and boasts a nicer cabin. Good stuff. This is a car whose mechanicals are spot-on, but a few other elements are … not. With a terrific ride/handling combination, chassis dynamics are among the best in this class. The base 2.0-liter engine and manual transmission are a joy, and they delivered a stunning 44.5 mpg in a 120-mile stretch of mostly moderate-speed highway cruising (admittedly about optimal for fuel economy). Folding the rear seat back reveals a low-roofed but spacious flat-floor cargo area. Many interior surfaces are padded, including thin cushioning on the door tops–much to the delight of my left elbow. Our tester was a high-end Touring edition, and I wonder if a “lesser” model would have come off better, as some complaints I had might be due to features included with this trim level. John and Tom like the 3’s cabin more than Rick does. It’s rare I find a seat uncomfortable, but for some reason, the high-bolstered cushion on this one pinched my (rather narrow) frame, making my right leg go numb. On the positive side, the driver gets a manual lumbar adjustment. Instrument-panel info is limited to a center-mounted speedometer, bar-graph fuel gauge (ugh), and — far to the left — just about the tiniest tachometer I’ve ever seen … something that would probably be far less troubling if it weren’t for our tester’s manual transmission. And then there’s the control layout. Although the climate controls are low-mounted, they’re within easy reach. What’s not as easy is adjusting them; temperature is by rotary knob, but fan speed and mode are by inconvenient repetitive-step pushbuttons. It seems John and Tom are split on the touch-screen/control-knob audio interface. But Tom has been known to consume iced tea in thoroughly brain-clouding quantities, and it appears that day’s BOGO Big Gulp special at the local Mini-Mart had the entirely predictable effect. So I’m siding with John here; the process of twisting and punching your way through numerous screens to do what many manage with a single button seems an entirely unnecessary distraction. And although it’s not at all related, tweaking my second biggest sore point are thickish roof pillars that restrict visibility. In the compact class, my long-time benchmark is the Honda Civic. As far as I’m concerned, any competitor has to have superiority in at least one area in order to be truly worthy of consideration. In the case of the Mazda 3, one of those areas is its hatchback body style — a cargo-carrying coup over the Civic, which only comes as a sedan and coupe. Another is its choice of engines: The base 2.0-liter in our tester seems about as lively aa the Civic’s standard 1.8, but it’s the 3’s available 2.5 that makes this compact-class contender stand out. 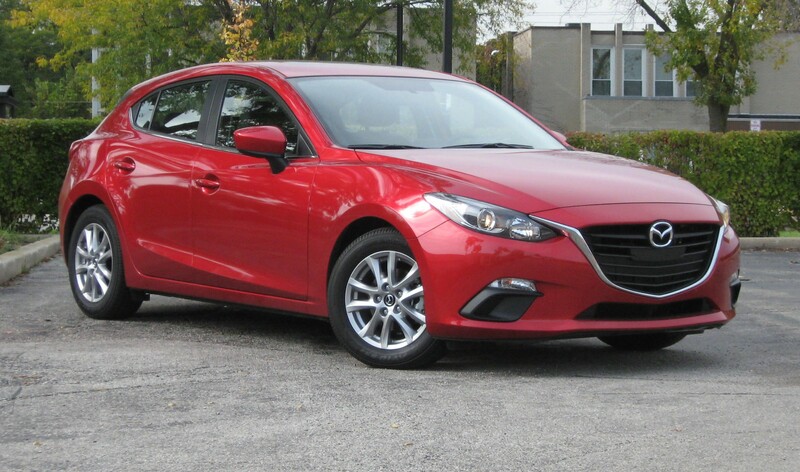 So perhaps we just didn’t get the optimal Mazda 3. A base hatchback with the standard seats and simpler audio system might have been more to my liking, and certainly the “s” model’s potent 2.5 overshadows a lot of ills. Mazda seems to have a good basic car here; perhaps it’s just the ritzied-up versions that don’t really float my boat. Written by: The Daily Drive staff on October 22, 2013.on February 25, 2019.